I remember it was on a school bus. Was I in middle school? Maybe. But wait, I didn't take the school bus in middle school, so it must have been elementary school, when my family had first moved to Tennessee from Florida. No matter. The bus was bumping along a narrow, wooded road on a steep hillside. 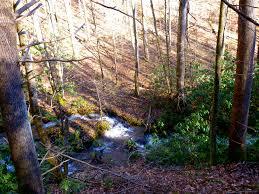 The road followed the winding path of a creek that lay like a dark ribbon of shine in the ravine below. We were all in shade and I was a little bit scared. Sometimes the bus's right wheels went a few inches off the pavement, and I imagined how easy it would be for us all to go tumbling down the ravine into the murky glimmer of that creek. It wasn't my first time on this bus, but it and the route were new to me. The cluttered dark woods of East Tennessee were new to me, too. I hadn't come to love them yet. On the inside I was still a Florida girl. I knew treeless Atlantic beaches, a yard bordered with yucca, a canal lined with paper birches that was the wonder and pleasure of all the neighborhood children. The water in that canal rose and fell with the tides and held silvery little fishes. Everything was sunshine bright. Shadows were scarce. Tennessee gave me moss and decaying logs, shy salamanders, blackberries and their thorns, the perfume of leaf mold. A girl—her name was Theresa, I think—lived in the darkest part of the bus route, in a small frame house across the road from the creek. She often wore thin, tight-fitting cotton shirts in faint plaid patterns of blues and grays. Shirts with silver snaps instead of buttons. She had a crown of thick black hair that parted down the middle and waved on either side of her face, defying gravity. A trick my own tresses, disappointingly lank, never learned. Teresa had a momma, too. A serious-looking woman who sometimes appeared garbed at the bus stop in what I later learned was called a housedress. And she had a much younger sister, a pale waif of a child whose wispy yellow hair was nothing like the dense dark waves shared by Theresa and her mom. One day, when the bus dropped Theresa off and the blond toddler ran across the yard to greet her, I heard murmurs as the driver pulled away. Snatches of words, hushed and knowing. Story was that Theresa's little sister was not her sister at all, but her niece. That Theresa's older sister, whom I'd never laid eyes on, had gotten pregnant in high school and that the grandparents, Theresa's momma and daddy, had decided to raise the girl as their own child. The story disturbed me. Not in a dramatic, knock-you-in-the-stomach kind of way, but uncomfortably, like cold dampness that creeps into your skin and hurts when it reaches bone. I was rattled, worried. I thought about Theresa's teenage sister, playing sister to her own daughter. I thought about the stern woman in the housedress, pretending to be her own grandchild's momma. I thought about the little girl, playing with her plastic bucket and shovel in the dirt, and imagined a dust storm whirling around her head. Invisible only to her. And I thought about Theresa, the same age as me, living inside a secret I understood was more dangerous than any ravine. Of course, my family had secrets of its own. But at age nine or ten, whatever I was then, I was ignorant of them. Overhearing those whispers on the school bus was my first direct acquaintance with something a family hid, or tried to hide, from the world, from each other. I remember it like a storybook: a meeting in a dark wood, the surprise, the narrow escape. Decades later, dark woods and deep ravines no longer frighten me. But secrets? If I let them, they still put a chill in my bones. Read my new short play, "Wake," inspired by this experience here.